The Chronicle Wired Campus blog had a post today about Abilene Christian University giving iPhones (or an iPod Touch - but really who is going to turn down the phone?) to students. They also have a video (part 1/ part 2) about how the phones/ iPods could be used on campus. 'll be interested to see what comes of this in reality other than lots of free publicity for the school. Intriguing concept with the iPhone though instead of just MP3 players. Interesting bit of gossip from the Chronicle Wired Campus blog. Would be cool I guess. But honestly, I think Lessig does more to raise awareness on intellectual property issues from outside the political world. In Congress he would be one of many backbenchers trying to be heard. Although that is fairly cynical for the Friday before a long weekend. So Lessig For Congress! Sound Opinions on Chicago Public Radio (and syndicated elsewhere and available as a podcast) is becoming one of my favorite things on the "radio". This week featured a very interesting interview with mashup (for lack of a better word) artist Gregg Gillis aka Girl Talk. Gillis uses a laptop to create musical collages from loops of various popular and obscure songs. I'd heard his stuff before and it really is some of the most innovative mashup/ dj type things out there. But maybe the most interesting thing about Girl Talk is his live shows, which are total punk rock dance party insanity. The Sound Opinions guys called him the Iggy Pop of djs or something like that. Take a look at this video to get an idea what he does and see some live clips. If you dig it, check out this cool movie of him taking a show out on the street in Montreal. And his show at Pitchfork last year got shut down due to crowd control issues. Remember, he is actually playing music live on a laptop by adding and subtracting various loops during all this. Oh yeah, all of this music is totally illegal. In fact, Gillis records for a label called Illegal Art which is run by someone using the name Philo T. Farnsworth as a protest of copyright law. There is a very thoughtful discussion of the implications of sampling/ mashups/ whatever near the end of the Sound Opinions piece. This undated interview gives some details about the philosophy behind Illegal Art too. Interesting stuff! I'm personally all in favor of this sort of flaunting of our outdated copyright laws. And I have no problem saying that Gillis is as much of a musician as someone who plays guitar or drums or sings. What do you think? And just to make you hungry, I had an awesome brunch of Huevos Diablos and a bloody mary at the Handlebar in Wicker Park today. Handlebar probably has my favorite brunch and bloody mary in Chicago right now. Sorry Silver Cloud fans (you know who you are). I left my phone in the car, so no documentation. 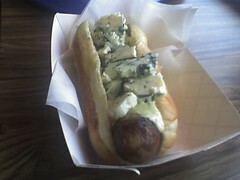 But here is a picture of a spicy alligator sausage from Hot Doug's. Hot Doug is as much of punk rock mashup artiste as Girl Talk. He just works in encased meats. If I want to learn something about Islam, I go to a book. I don't derive my knowledge from Facebook, but I do like to discuss things, and that's why I like Facebook. Here are my Spring 2008 presentation dates. It is a brief tour of the East Coast. Not many cities, but multiple shows in each. * Podcasting and Videocasting Bootcamp (Preconference Workshop w/ David Lee King). Computers In Libraries 2008. April 6, 2008. * 2.0 Pecha Kucha - Conversation Face-Off (w/ multiple people who are smarter than me). Computers In Libraries 2008. April 8, 2008. * Practical Podcasting (Preconference workshop). New Jersey Library Association Conference. April 29, 2008. * We're Down with OPP (Other People's Podcasts) (Panel w/ multiple podcasters). New Jersey Library Association Conference. April 30, 2008.